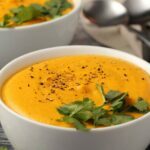 Vegan Butternut Squash Soup – Roasted and Delicious! 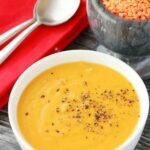 When I decided to do a vegan butternut squash soup for this blog I decided I wanted to make it the richest, most comforting of comfort foods type dish possible! And this is it! 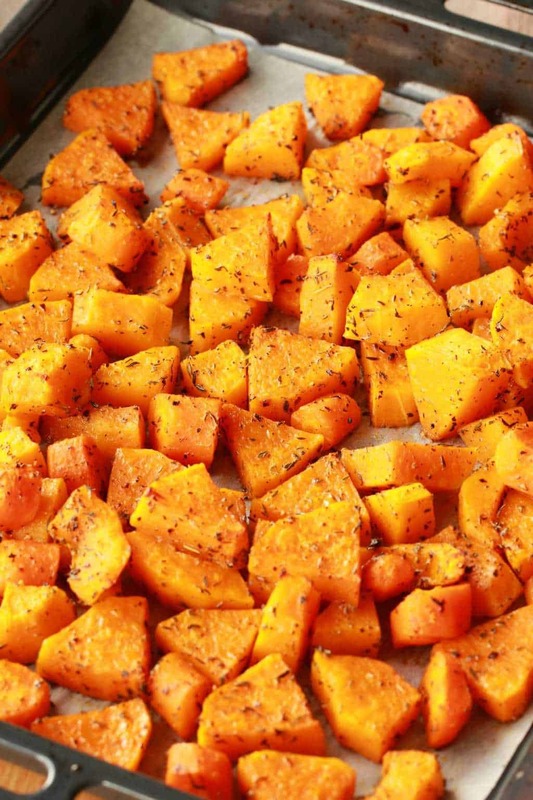 So of course, it has to be roasted butternut, that’s the best kind! 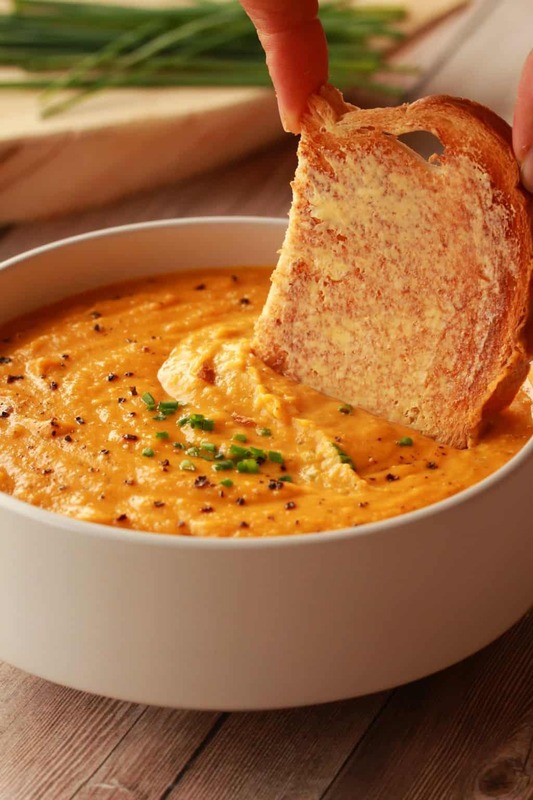 Roasted butternut squash soup that is rich, creamy, thick and ultimately delicious! 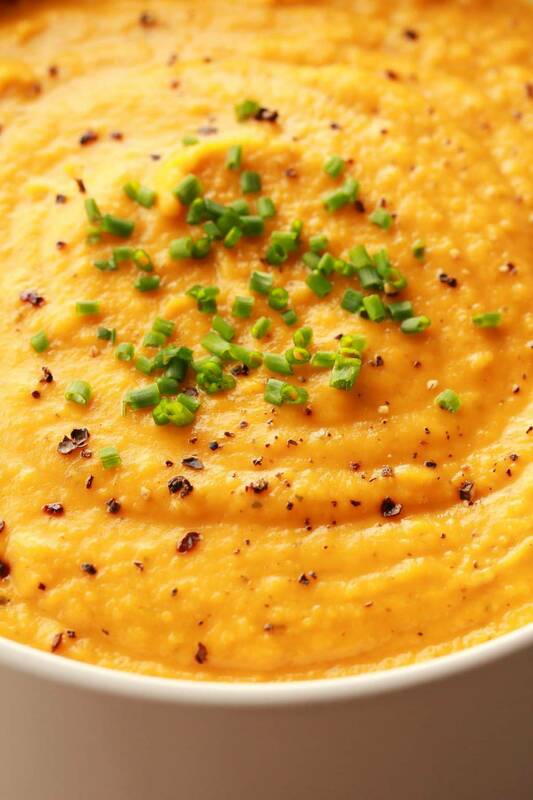 So how do you make a vegan butternut squash soup? We roasted the butternut with some chopped carrot in some olive oil and spices. 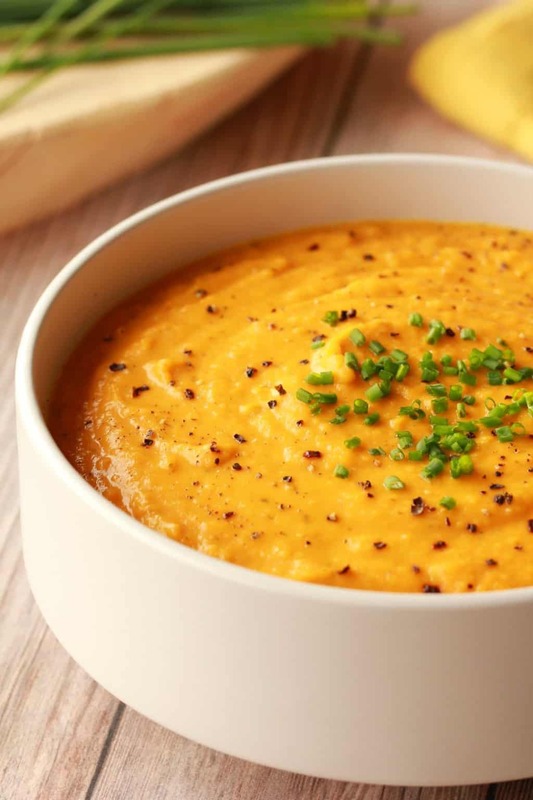 Carrot is a great addition to a vegan butternut squash soup because it adds beautifully to the color and the texture. 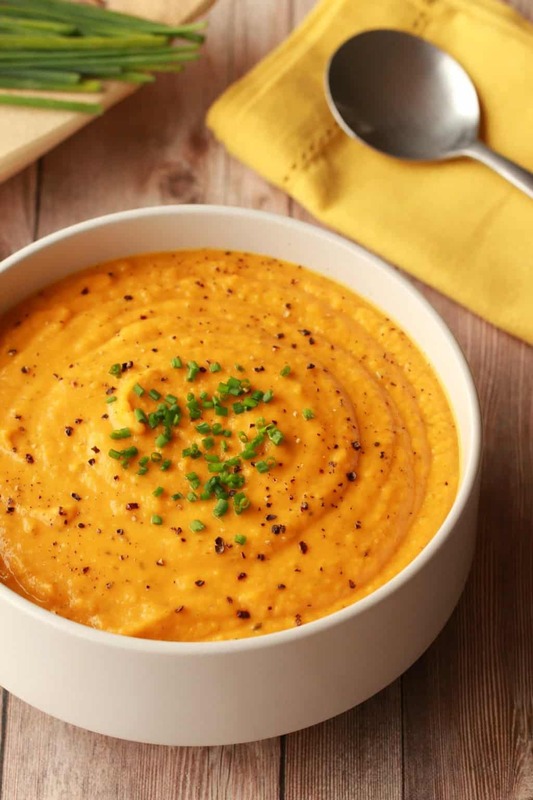 And once that butternut and carrot is perfectly roasted, you add it to a pot with sautéed onions and garlic and spices and then add coconut cream and vegetable stock (and a little soy sauce) to create an ultra gourmet roasted butternut squash soup. Serve with chives and black pepper sprinkled over the top. I used coconut cream for this rather than coconut milk as I wanted it as rich and creamy as possible. 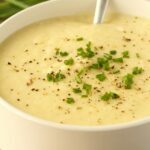 But you could absolutely use coconut milk (or even light coconut milk) if you wanted to make this soup a little lighter. It wouldn’t be as thick and rich, but it would still be awesome! 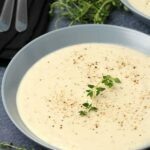 I consider my immersion blender to be a godsend when it comes to soups! You just blend it up right in the pot! Ours is rather an old model and I can’t find it on Amazon, but this hand blender is very similar to the one we have. But if you don’t have one, you can also transfer to a blender jug and blend it up there but you’ll have to do it in stages as this is a big pot of soup. 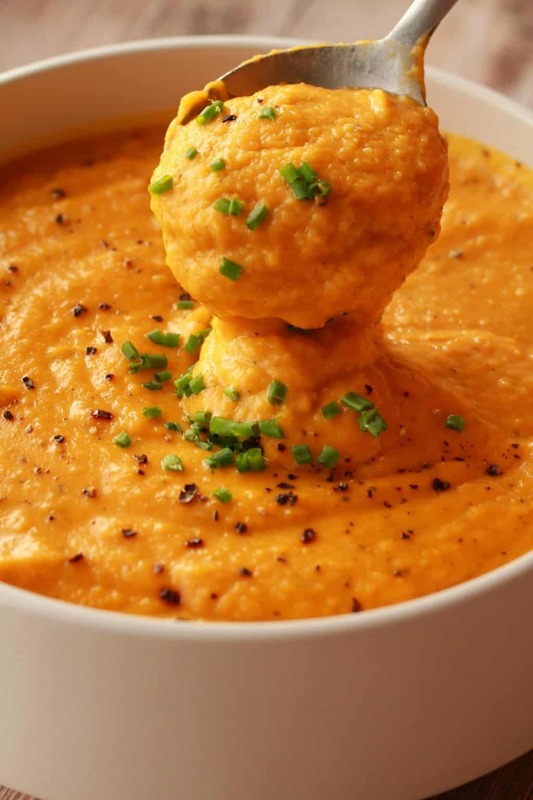 It makes a wonderful appetizer that’s also filling enough to have as a main! It keeps beautifully in the fridge and can be reheated the next day. 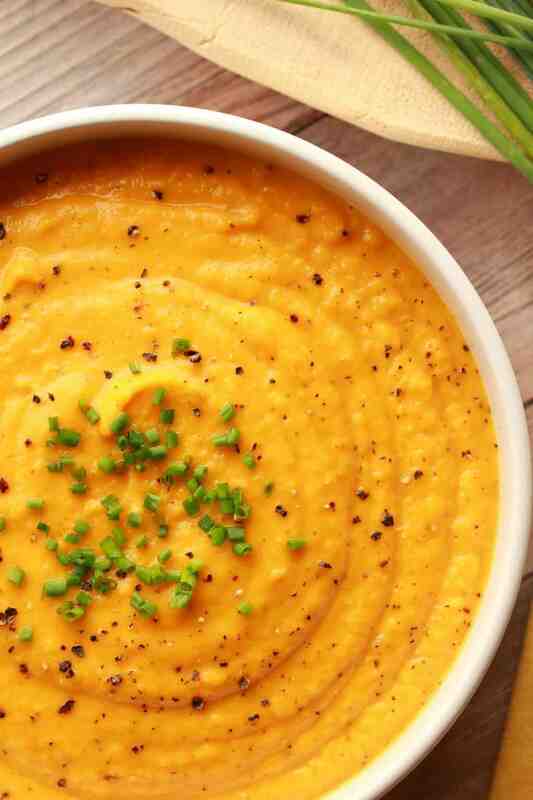 So what do you think of this vegan butternut squash soup? Let us know in the comments, and if you make it, please rate the recipe and let us know how it worked out for you! 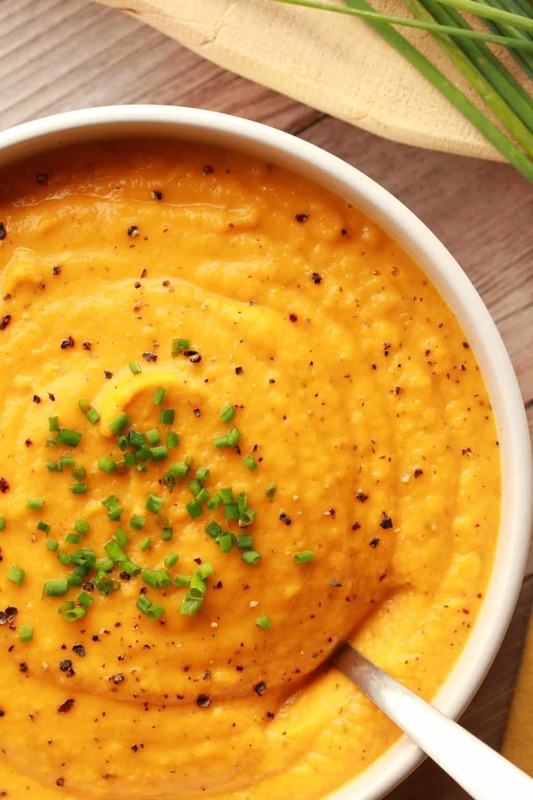 Want more awesome vegan soups? Look no further! And heaps more! 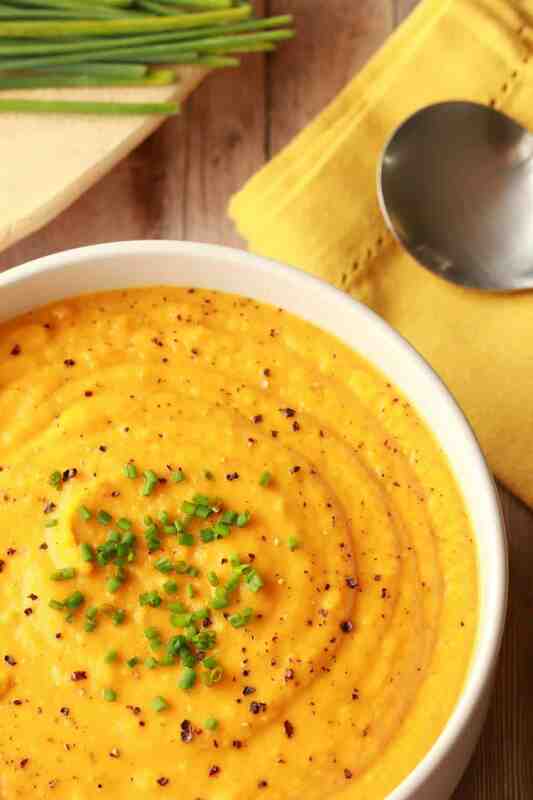 Search ‘soups‘ to see all the great soups we’ve made! Sign up to our email list as well while you’re here – you’ll get an awesome free recipe ebook and you’ll be the first to know when a new recipe is posted to the blog! 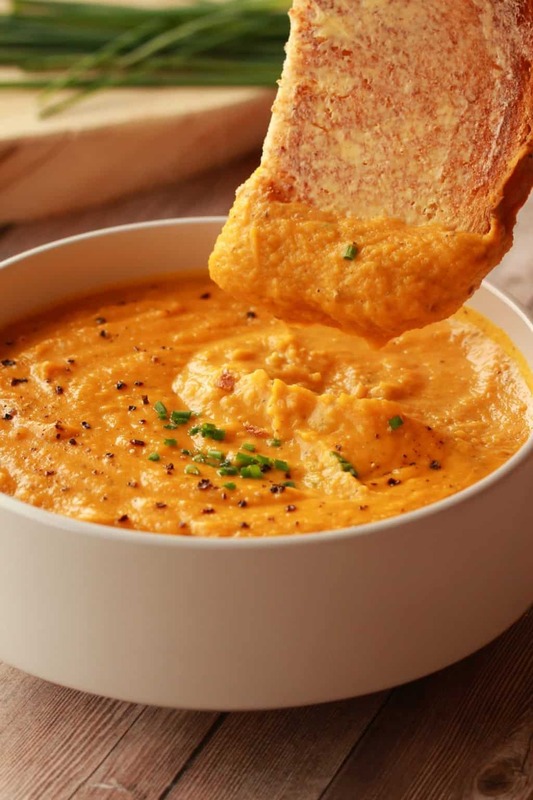 Rich and creamy vegan butternut squash soup. 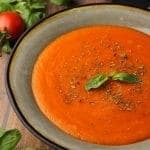 This vibrant and colorful soup is wonderfully easy to make and the results are sensational. Peel and chop the butternut squash and carrots. Place into a bowl with the olive oil, salt, black pepper, thyme and basil and toss together until the vegetables are coated in the oil and spices. Place onto a parchment lined baking tray and place into the oven to bake for 35 minutes until vegetables are roasted. Place the chopped onion, crushed garlic, olive oil, cumin and paprika into a pot on the stove and sauté together until onions are softened. 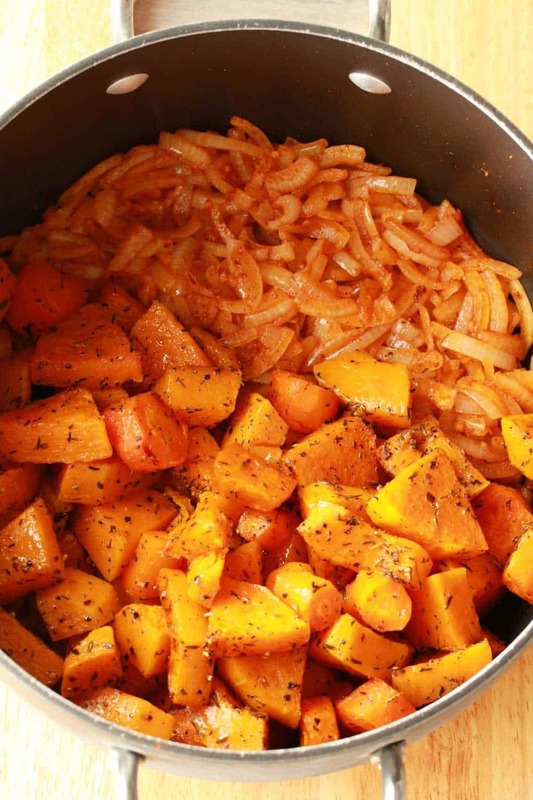 Then add in the roasted butternut and carrots and toss together. Add coconut cream, soy sauce and vegetable stock and bring to a simmer to blend the flavors. 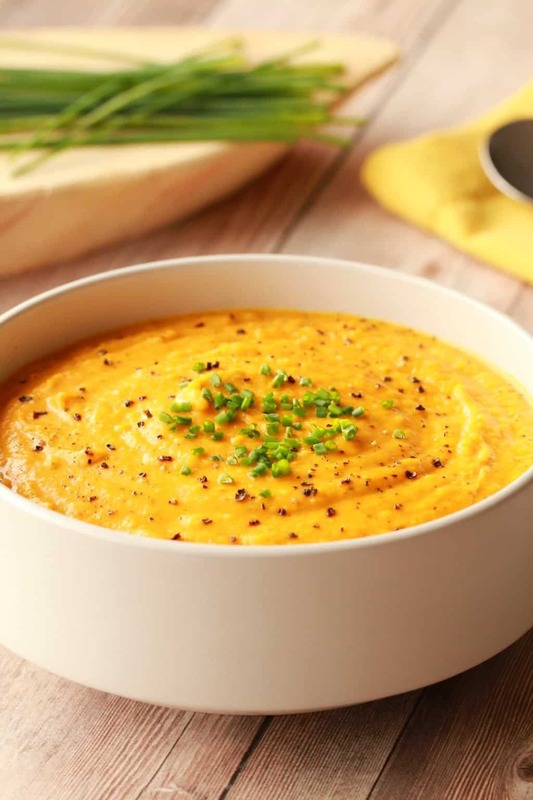 Remove from heat and blend with an immersion blender or by transferring to a blender jug to blend it up in stages. *Use a gluten-free soy sauce or switch for tamari if you want to make this entirely gluten-free. *Prep time includes time spent roasting in the oven. 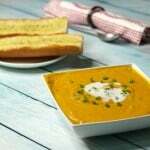 Delicious, comforting and filling soup! I don’t like coconut anything, can I use regular cream or half&half? Any cream will work here. Can I substitute rice milk? I just made this and it is delicious! Tasty, hearty, filling and perfect for a chilly day like today. This is definitely going in my rotation. Thank you! My carnivore husband loved it.. I’ve been vegan 23 years and this is the best by far, and made the rollin oatmeal cookie. Yummmmyyyyyyyyy!!!!! Made this soup today…added potatoes to the recipe. It is sooo delicious. Thank you! All I can say is OMG!!! Sooooo good. 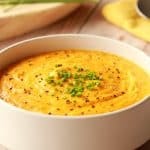 I had already started cooking the squash in the instant pot when i came upon this recipe, so I quickly adjusted it. I took out the squash when it was done and threw in the chopped carrots for 3 minutes under pressure. When they were done I put on the sauté function, and followed the recipe from there. I absolutely LOVE it! Thanks for a great recipe, I was getting a bit bored with just adding Thai Red Chile paste to pureed butter nut squash. This got me out of my rut and was super easy! I just made this soup this morning for Thanksgiving. It is incredible! The only modifications I made were to omit the soy sauce, and since I did not have coconut cream, I simply used coconut milk. Still came out rich and delicious! 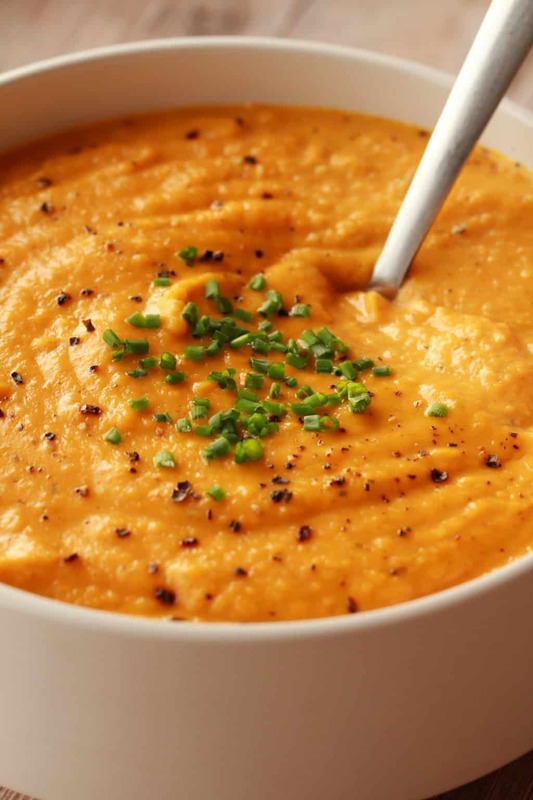 This is my new favorite butternut squash soup recipe. I do add 2 pieces of celery, 1 cup of cashews and a few sweet potatoes to the mix as well. Everyone raves about this soup. I’ve made it 4 times now. Thank you so much for this recipe. The cream of coconut is amazing and you cant taste the coconut. wow – so.simple.and.delicious!! Thank you! It turned out great, but i realized something was missing, you definately need to add at least double the garlic that is stated here it will make a world of difference! I purchased frozen cut up squash for ease. How many cups do you estimate I should use? Hi Ellen, you’re probably looking at about 8 cups. This doesn’t need to be an exact measure, if you used a smaller amount your soup would just be a thinner consistency but still good. Delicious! I had some roasted butternut squash that I’d overcooked a little, so this was a perfect way to use it up! I avoid dairy but not meat (sorry! ), so I used chicken broth and that was also tasty!